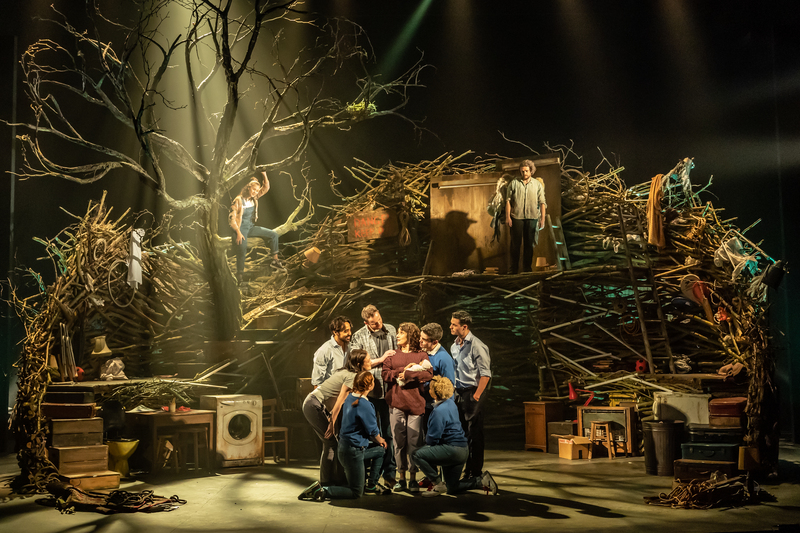 Emotionally invested: Naomi Obeng writes on a stage adaptation of a childhood favourite which ‘plainly plays with magic’. My mum introduced me to Skellig. I was in primary school. It might have been summer. I definitely wasn’t that into reading books. Generally my mind drifted, so it was hard to keep track of the narrative I was reading and the entirely different one I was developing in parallel. Sometimes books were just sentences on a page, sometimes they were womblike environments that cradled and stirred. I couldn’t understand the reason for the difference. I found that frustrating. That lack of control. That randomness. Thankfully Skellig was one I got lost in. Mina and Michael have been with me since I was 7. The girl who learnt at home, lived outdoors and asked questions, read poetry and felt free. Michael who moved into a new house with a broken garage, whose baby sister came early, tiny, sickly, between life and death. Why her? Why? The lack of control, that’s the feeling that struck me most about Skellig when I first read it. Michael’s anguish, desperate to make things better but with no power to heal. It’s difficult not to feel that again, as the low throb of a beat plays and the teal light pools around Skellig’s hunched, indignant, arthritic body. Lights pulse and flicker throughout the play, as if some divine presence were scoring the performance with colour. Skellig’s blue looks like he’s under the sea. Like he’s drowning. Maybe Michael is drowning. To have captured what to me was the book’s emotional core with lighting alone is special – we’re cradled in soft and safe hands. I gasp at first glance, so intriguing is this giant nest holding a world within it. Frankie Bradshaw’s set is some of the most arresting and detailed design I’ve seen in years. A place to rest heads, to travel distances, to fly, to play football and to learn. A safe haven for a story to unfurl. We wonder what the objects speckled among the branches might become. What part they will play. We’re surprised by the answers. Edward Harrison’s Skellig lurks like an apparition. When he disappears, the many groups of schoolchildren gasp. He gobbles noodles without chewing and the low patter of high voices that fills the auditorium for much of the play erupts into screams. There’s a lot of screaming. “Food of the gods.” I feel like that person who watches Shakespeare and grins at all their favourite lines (ok, I am that person, but I didn’t expect it to happen here). Sam Swann embodies Michael’s nervous energy, a child apart from his cohort because the spectre of death hangs around his family. Tanya Vital and Lauren Waine are inspired as Michael’s comical friends Leakey and Coot. They are part of an ensemble whose synchronised movement focuses the energy on stage, like a pulsing drum. Their narration is dizzying after a while, but it keeps good pace with a child’s patience. Imagine the noises when we finally see Skellig’s wings. In 2010 I sit pressed up in the narrow width of my corridor at home. Lifted off the ground by my own body weight, feet and back against rough plastered walls, with my hands gripping a white and gold hardback (eager). My name is Mina. I circle sentences with my eyes, feeling seen and seeing. I’d almost forgotten her, but she feels as real as anyone. As real as this girl, who’d rather make a hammock of air to read a book than sit in a goddamn chair. Do casting directors know what deep emotional impacts their choices can have on audiences. They’d better know by now. Write it in the CDG guidelines. I wish that some of the darkness might have had its colour contrast increased. Michael is sick with worry, but we don’t feel so much for him. For all the pace I want some deeper connection – though maybe I’m searching for something only a book and many years can forge. “Hell’s teeth.” I look at my mum who’s sitting beside me. We smile at our years of privately quoting Skellig, echoing back at us. I think of asking her questions for this review, but realise that there isn’t anything to ask that Lisa Blair’s direction hasn’t given weight to. A production that plainly plays with magic. We watch Mina, Skellig and Michael lifted above the stage, framed by soft white feathered wings. Their grins reflected in the sea of young faces looking up at them. Skellig runs at Nottingham Playhouse until 7 April. More info here. Naomi Obeng is an East Midlands based writer and arts journalist.